The First Friday of every month, shops and galleries on Prince Street and all over town stay open late to showcase their art. Theatre, music and art flourish in Lancaster City with Gallery Row at the center of the Lancaster art scene! 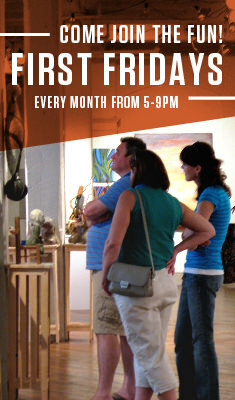 Come inside and see what the city is painting and be awed by world-class artists on this First Friday. Take a stroll around Lancaster City and marvel at groups of musicians scattered throughout the streets. With music from country and folk to blues and Celtic rock, Music Fridays feel like living in and iPod shuffle! Shops downtown extend their hours to stage local and regional musicians. 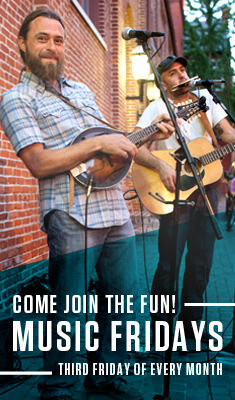 Come share in the fun and sing along in Lancaster City every third Friday! May through November, the second Friday of the month. Plus some Saturday mornings! Although on its surface Lancaster might look like your typical meat-and-potatoes city, it is overflowing with international spice! The flavor profile of this city mixes everything from Vietnamese and Latin to Greek and soul food. Grow a few new taste buds and tour the town with Taste the World Lancaster! Launch Music Festival and Conference has showcased over 1000 artists from all over the country in Lancaster City over the past 9 years, representing a wide spectrum of music styles. All within a three-block radius, come and discover artists who might be the next-big household name! The conference is packed full of seminars, panels, parties, events and performances for artists, music industry professionals and fans to meet network and further their careers. This unique festival offers any music lover the chance to immerse themselves in a music lover’s paradise. Join Lancaster City for a forty-plus-year tradition, the Red Rose Run! This 5-mile trek traverses the city streets as runners from all throughout the northeast compete for first place. The Red Rose Run offers a kid’s fun run, live music performances, as well as light snacks and refreshments for runners. This fun event is fun for runners and spectators alike! Lancaster Pride Week is a weeklong event that celebrates the diversity of the lesbian, gay, bisexual, transgender, questioning and ally communities in Lancaster County. This events helps to educate and celebrate people who are different and helps to build a safe and understanding community in Lancaster city. If looking for a Kiki, drag show, brunch or event just a place to dance and party, Lancaster Pride Week in the perfect event for you! This annual event is the unofficial kickoff of each summer. Every Lancastrian has been to Celebrate Lancaster and for good reason! With two dozen food trucks, two stages, six live bands, two pubs areas and fireworks doesn’t get you excited, this event showcases the cultural diversity of our city. It’s a great chance to share and celebrate with you friends and family all things Lancaster City! For the past five years, Downtown Lancaster transforms into a two-block pub for one day only! Lancaster Craft Beer Fest aims to provide craft beer drinkers with an amazing selection of unique beers to discover as well as some classic favorites. With dozens of options from some of the best local and national craft breweries, beer aficionados will rejoice. Beer lovers and novices alike will love the experience. No one says Merry Christmas quite like Santa Claus! Join him, and the entire town at our time-honored tradition of the Mayor’s Tree Lighting and Tuba Christmas. Enjoy live entertainment, the lighting of the Christmas tree, and night hours of the Lancaster’s famous Central Market. Let the Mayor’s Tree lighting and Tuba Christmas sprinkle fun and holiday cheer into this year’s Christmas season! Say goodbye to the year the right way. Ring in the new year in Downtown Lancaster with free concert, lowering of the Red Rose and fireworks at midnight! New Year’s Eve in Lancaster Square is a must-attend event.